Delicious Thai Food & Dessert Recipes – Healthy Tips ! Provide variety of delicious recipes about Thai Cuisine, Thai Food, Thai Menu, Thai Dessert, Healthy Food, Chocolate, Cake, Brownie and Healthy Tips ! Heat coconut cream and sugar. Simmer until condensed. Add egg yolk, wheat flour, and orange color. Mix them well. Stir until condensed. Mix egg yolk, salt, with water. Pour into flour mixture and knead well. Roll the flour thinly and cut into circle. Bake until cooked and light yellow. Heat the sugar and jasmine water until boiling. Dry-fry watermelon seed with syrup until sugar dried and sharpen. Dip the watermelon seeds in sugar. Stick them at the edge of the flour. Shape the base flour into small balls. Put in the center and score into sections. Shape the tiny balls and place them at the top as part of the crown. 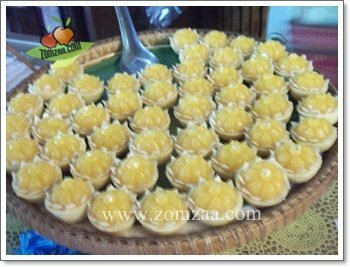 The Golden Crown or call “Kanom ja mong ku” is the yellow thai dessert recipes look nice and quite delicious.